Sand dunes are among the most widespread aeolian features present on Mars, serving as unique indicators of the interaction between the atmosphere and surface. On a planetary body, dunes accumulate where a supply of sand-sized grains exists or may be abraded, is carried downwind by winds of saltation strength, and is subsequently deposited where these winds weaken below the threshold for sand transport. As a result, the study of dune processes contributes to both atmospheric and sedimentary science. Both the presence and morphology of sand dunes are sensitive to subtle shifts in wind circulation patterns and wind strengths, which are thought to be influenced by changes in Martian orbital parameters. The spatial distribution of aeolian sand relates to patterns of sedimentary deposition and erosion of source materials, giving clues to the sedimentary history of the surrounding terrain. Dunes are particularly suited to comprehensive planetary studies in part because they are abundant on the Martian surface over a wide range of elevations and terrain types, and in part because they are large enough to be studied using the wide suite of spacecraft data now available. Thus a global scale study of Martian dunes serves a dual purpose in furthering understanding of both climatic and sedimentary processes, two fundamental topics currently driving Martian science. Previous aeolian studies of the Martian surface relied on Mariner 9 and Viking Orbiter images to examine and map aeolian morphologies. More recent studies, using high-resolution images like Mars Global Surveyor (MGS) Mars Orbiter Camera narrow angle (MOC NA) and Mars 2001 Odyssey Orbiter Thermal Emission Imaging System (THEMIS) visible range images (VIS), have enabled scientists to re-examine surficial areas from earlier investigations and see new aeolian deposits unresolved by previous instruments. 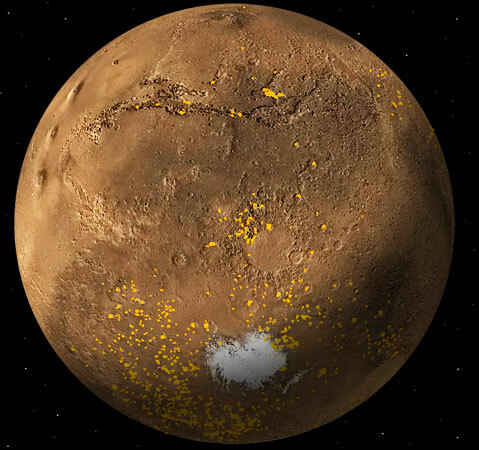 As a result of the influx of high resolution data, the Martian stratigraphic column is undergoing rapid evolution as are the interpretations of much of Mars' geologic history, contributing to new insights about Martian aeolian processes and relationships. Surface images from both orbiting spacecraft (e.g., from MGS MOC NA) and Mars Exploration Rovers (MER) demonstrate how ubiquitous erosional and depositional features of aeolian origin are on the Martian surface.